So what’s in a name? In some cases, the heritage of a name is like a national treasure – and that’s certainly true for Alpine. Its DNA blends Renault’s sporting passion and technical expertise. The Renault Alpine A110-50 concept car translates the most characteristic design features of the original A110 in a modern and spectacular way. The carbon-fibre bodywork features a new shade of blue which refreshes and reinterprets the famous original ‘Alpine Blue’. 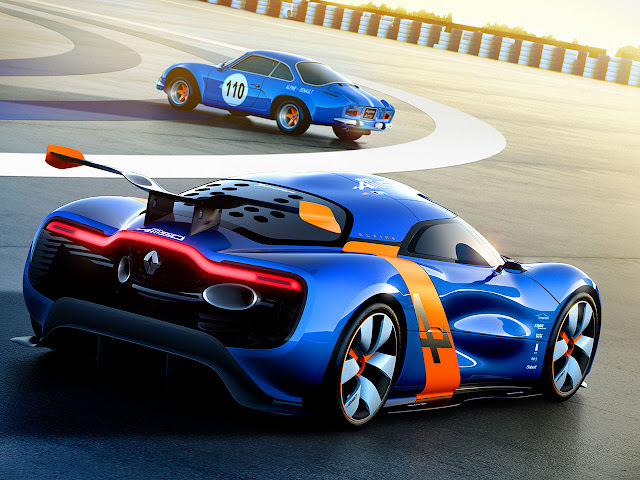 Produced with the renowned expertise of Renault Sport Technologies, the Renault Alpine A110-50 concept car is imbued with the world of motorsport. It benefits from the experience gained from the racing Mégane Trophy by using the same technical platform. Concept and Show Car Director. To mark the 50th anniversary of the iconic Berlinette, Design Yann Jarsalle and Concept and Show Car Director Axel Breun reinterpreted the original design cues to include the new Renault design language introduced by Laurens van den Acker with the DEZIR concept car, and which will soon be rolled out in the company’s future models. The new front-end look, with the upright, confident diamond, has been adapted for this very low and wide car. 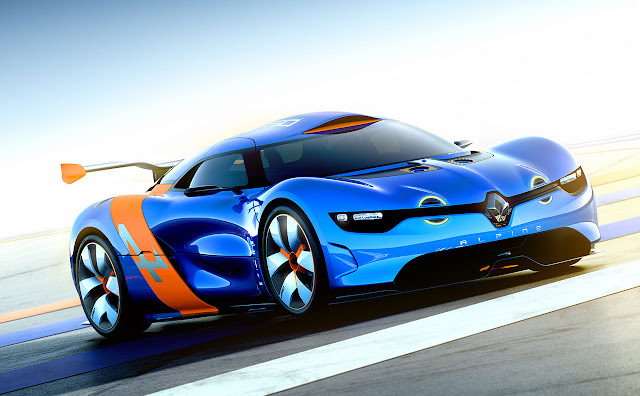 The Renault Alpine A110-50 is a car of today; a bold embodiment of RENAULT’s passion for motorsport. Laurens van den Acker, Senior VP, Corporate Design. The sculpted forms of its elegant, flowing bodywork, enhanced by lights over which air seems to flow effortlessly. The half-domed additional lamps, with a technical but nostalgic interpretation, thanks to full LED yellow lighting – as it should be! A characteristic 3D rear window, which reveals the mid-rear engine. Air intakes on each side echo the ducts on the rear wheel arches of the Berlinette. The right-hand opening is for gearbox cooling, the left is for the engine bay. Produced by Faster, the carbon-fibre bodywork features a new shade of blue which refreshes and reinterprets the famous original ‘Alpine Blue’. Every opening panel does so with dynamics worthy of the finest GTs, with the bonnet hinged at the front and the engine bay cover opening towards the rear. The doors feature a scissor motion. “The car is very curvy, like the Berlinette, while expressing the three key words of our new design policy: simple, sensual and friendly” Axel Breun. The driver’s seat features embroidered ‘Renault Alpine A110-50’ badging, Sabelt full harness belts and different, attractive shades of blue. The dashboard is particularly uncluttered. The Renault Design-created steering wheel incorporates a colour screen and houses the same technology as a Formula Renault 3.5 single-seater to provide drivers with all the information they need. Racing driver equipment is provided by Sabelt and the helmet is created by Ruby. Produced with the renowned expertise of Renault Sport Technologies, the Renault Alpine A110-50 is imbued with the world of motorsport. It benefits from the experience gained from the racing Mégane Trophy by using the same technical platform. 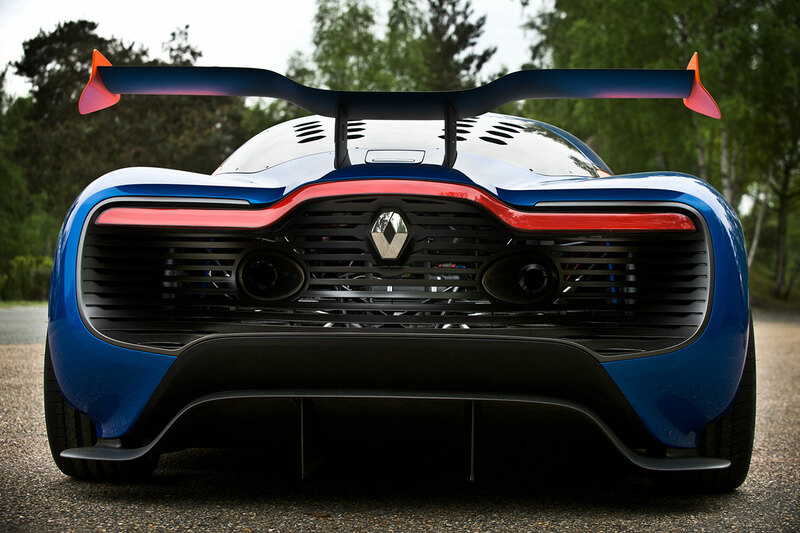 Acclaimed by drivers in the WORLD SERIES by RENAULT, the tubular chassis of the Renault Alpine A110-50 has been stiffened and undergone several developments. The roll cage and bracing in the engine bay have been modified (lowered) in the workshop of Tork Engineering to adapt them to the vehicle’s height, which is lower than that of Mégane Trophy. The digital design work was led by Renault Design, Koller and Etud Integral, while final assembly was carried out by Protostyle. The final weight distribution is almost ideal, with 47.8% over the front wheels. The efficiency of the Renault Alpine A110-50 concept car is largely generated by ground effect. At the front, a splitter hidden in the bumper generates low pressure, which results in significant aerodynamic downforce. At the rear, a diffuser accelerates air flow beneath the floor. Ground effect therefore accounts for more than one-third of the car’s downforce, with the rest coming from an adjustable rear wing. The 21-inch wheels, with a single central nut, are specific to this car and fitted with road-homologated Michelin tyres. The inlet manifold is fed by a new roof-mounted air intake. This development broadens the engine’s power band, with additional horsepower at all engine speeds. The engine mapping has been optimised for these modifications. 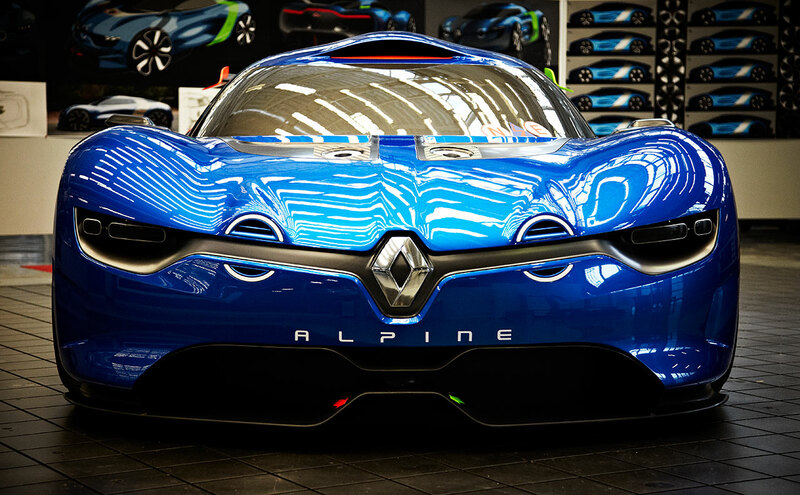 All data collected by the Renault Alpine A110-50 can be analysed using version 4 of the benchmark Wintax software. Wintax 4 enables advanced analysis of more than 50 parameters: engine speed, gear, steering angle, car speed, throttle position, brake pressure… This information allows drivers and engineers to optimise settings and driving style. Wintax 4 data analysis also enables even faster diagnosis of any technical problems. “Developing this concept car was a great adventure. It was a catalyst for creativity. We wanted to make a Berlinette that was of our time, and which boldly embodies Renault’s passion for motorsport. We were guided by our hearts and emotions.” Axel Breun.